River Valley junior Jared Reese, left, breaks away from the line of scrimmage during a Week 2 football contest against Gallia Academy at Memorial Field in Gallipolis, Ohio. River Valley landed two players on the 2018 Ohio Prep Sports Writers Association Southeastern Ohio All-District football team for Division V, as voted on by numerous media outlets within the southest district. Senior Ty VanSickle was a first team selection on the offensive line in D-5, while junior Jared Reese was chosen as a special mention honoree. Reese ran for 341 yards and four touchdowns on 54 attempts this season, and also had 15 catches for 168 yards and two scores. The Raiders finished the year with a 1-9 overall mark and finished last in Tri-Valley Conference Ohio Division play. Talyn Parker of Portsmouth was named the D-5 Offensive Player of the Year, while Evan Dahm of Wheelersburg and Ethan Duncan of Ironton shared Defensive Player of the Year honors. The D-5 Coach of the Year was Rob Woodward of Wheelersburg. Ends: Tanner Holden, Wheelersburg, 6-6, 180, Sr.
Linemen: Colin Boehm, Portsmouth, 6-4, 290, Sr.; Ty VanSickle, Bidwell River Valley, 6-0, 260, Sr.; Brady Rowe, Ironton, 6-2, 230, Sr.; Tristan Delong, Ironton Rock Hill, 5-10, 290, Jr.; Baylen Haywood, Wheelersburg, 6-0, 210, Sr.; Carson Russ, Oak Hill, 6-0, 190, Sr.
Quarterbacks: Gage Salyers, Ironton, 6-1, 185, Jr.; Trent Salyers, Wheelersburg, 6-2, 175, Sr.
Running backs: Talyn Parker, Portsmouth, 5-11, 188, Jr.; Reid Carrico, Ironton, 6-2, 205, So. ; Logan Hankins, Ironton Rock Hill, 5-11, 180, Jr.; Garrett Hurd, W. Ports. Portsmouth West, 5-7, 160, Sr.; Kamren Harless, Chesapeake, 6-1, 165, Jr.
All-Purpose: Josh Berry, W. Ports. 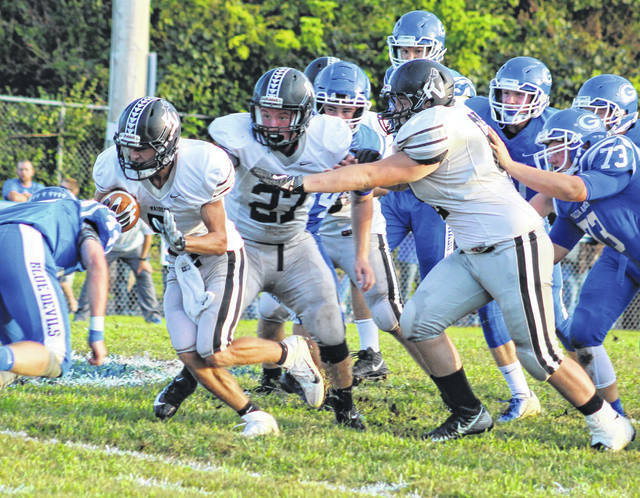 Portsmouth West, 5-10, 170, Sr.; Makya Matthews, Wheelersburg, 5-9, 175, Jr.
PK: Jalen Miller, Wheelersburg, 6-3, 190, Sr.
Linemen: Seth Fosson, Ironton, 6-1, 225, Jr.; Dakota Hess, Chesapeake, 6-1, 345, Jr.; Brian Carey-Knipp, Portsmouth, 6-0, 173, Sr.; Trevor Staggs, W. Ports. Portsmouth West, 6-2, 165, Sr.; Chase Stidham, Wheelersburg, 6-2, 200, Sr.; Caden Harden, Oak Hill, 5-11, 175, Sr.; Donnie Watters, Wellston, 6-3, 210, Sr.
Linebackers: Kaleb Easley, Albany Alexander, 5-8, 185, Jr.; Ethan Duncan, Ironton, 5-10, 215, Sr.; Luke Lindamood, Minford, 6-0, 215, Sr.; Evan Dahm, Wheelersburg, 6-2, 220, Sr.; Evan Horsley, Wheelersburg, 5-10, 185, Jr.; Bayley Clutters, Oak Hill, 5-7, 205, Sr. Defensive backs: Connor Kimbrough, Albany Alexander, 5-8, 140, Sr.; Austin Browning, Chesapeake, 6-1, 185, Sr.; Matthew Risner, Minford, 5-10, 170, Jr.; Bradey Chandler, Oak Hill, 5-7, 145, Sr. Offensive Player of the Year: Talyn Parker, Portsmouth. Co-Defensive Players of the Year: Evan Dahm (Wheelersburg) and Ethan Duncan (Ironton). Coach of the Year: Rob Woodward, Wheelersburg. Joel Morrison, South Point; Jared Reese, Bidwell River Valley; Brycen Thomas, Ironton; Hunter Humphreys, Ironton; Will Todd, Chesapeake; Brayden Friend, Ironton Rock Hill; T.J. McGinnis, Ironton Rock Hill; Austin Penrod, McDermott Northwest; Ty Wiget, Minford; Elijah Vogelsong, Minford; Ty Pendleton, Portsmouth; Bryson Morrow, Portsmouth; Dylan Bradford, W. Ports. Portsmouth West; Gabe Skaggs, W. Ports. Portsmouth West; Cole Staggs, W. Ports. Portsmouth West; Tanner Wilson, Wheelersburg; Justin Salyers, Wheelersburg; Kannon Pack, Piketon; Walker Smith, Oak Hill; Colin Hughes, Oak Hill; Johnathon Garvin, Wellston; Rylan Molihan, Wellston.